Window with two lights with rounded trefoil heads. Each light has eight panes. The panes have diamond quarries with clear glass. 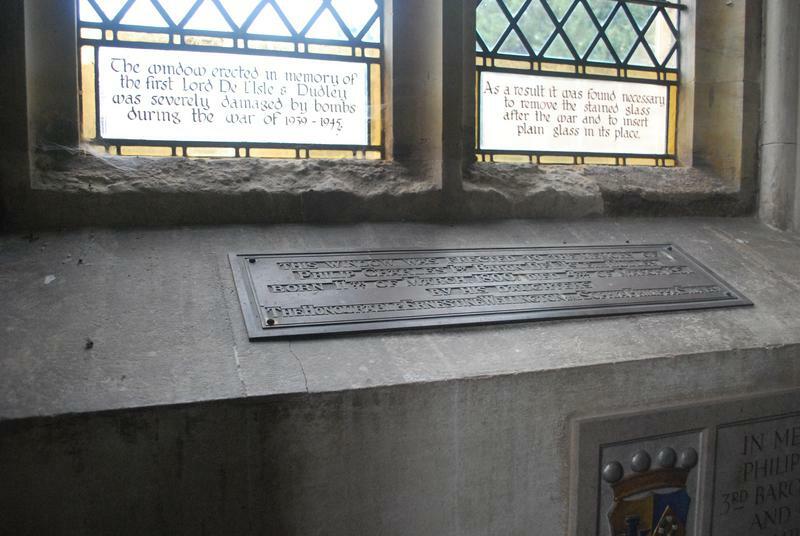 The lower border pane in each light has a rectangular white glass panel bearing the inscription and a yellow glass border. The window erected in memory of/ the first Lord De L'Isle & Dudley/ was severely damaged by bombs/ during the war of 1939 - 1945./ As a result it was found necessary/ to remove the stained glass/ after the war and to insert/ plain glass in its place. 1939-1945: The original window in this position was damaged by bombs during the Second World War and, apparently unsalvagable, was replaced by the modern window.